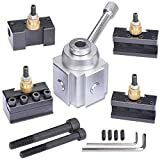 In this episode, we will be taking a deeper look at the JWGJW 120034 Tooling Package Mini Lathe Quick Change Tool Post & Holders Multiple Tool Holder (see more here: amzn.to/2CsIspA) for mini-lathes (see more here: diy3dtech.com/mini-lathes/) such as the Harbor Freight and Grizzly! If you have a mini-lathe or thinking about getting one, this is a MUST HAVE addition! For the money you can not beat it! ← MicroMill – Disassembly and Discussion !